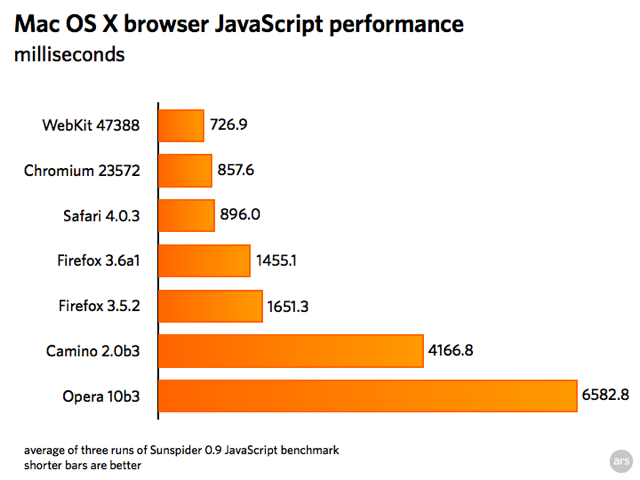 Ars Technica reports that the latest build of WebKit has outperformed Chromium by more than 15% in SunSpider benchmark. They have also tested Safari 4.0.3, Firefox 3.6 Alpha 1, Firefox 3.5.2, Camino 2.0 Beta 3 and Opera 10 Beta 3 web browsers. Sunspider benchmark is specialized for webkit engine, so it’s stupid to use it on different browser engines. Wait a minute. I thought Webkit was the browser engine and not a browser in itself? Are they referring to Chrome as Webkit here? The WebKit nightly is essentially a version of Safari that launches using the latest WebKit version instead of the installed system version.